Beno J. Gundlach Company was founded in Belleville, IL in 1927. The company was named after its founder, Beno J. Gundlach. It was Beno's brother, Bill, who had asked Beno to invent and design a manually operated cutter for asbestos roofing shingles. At the time, Bill was the local sales representative for the Johns Manville Corporation, the company who had introduced these shingles to the U.S. market. The cutter Beno designed received a U.S. Patent and was produced in a small building located at 11 North 8th Street in Belleville until the early 1930's. It was also in the early 1930's that asphalt floor tile was invented. Some manufacturers of this new floor tile asked Beno to modify his shingle cutter for use with these new flooring material. 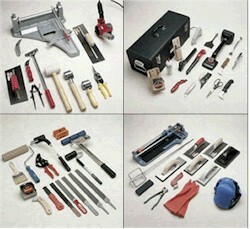 This marked the company's first entry into the manufacture of floor covering installation tools. Beno's eldest son, John B. "Jack" Gundlach joined the company shortly after August 1946, having served in the U.S. Army Combat Engineers in Europe during the last part of World War II. Jack worked part time for the company while completing his college education at St. Louis University. After graduation, Jack began working full time for the company. He decided to expand into the manufacture and sale of other flooring installation products, adding the manufacture of linoleum rollers in 1955. In the 1960's the business continued to expand and eventually outgrew its original building. The company moved to a new 11,000 square foot building at 717 North 17th Street in June 1971. Operations and product expansion continued in the early 1970's with Jack's second eldest son, Jeffrey B. "Jeff" Gundlach joining the business. In 1982 Jack's eldest son, Gregory J. "Greg" joined the business. Shortly there after the decision was made to build a 60,000 square foot facility at nearby 211 North 21st Street, the current location. The company moved its warehousing operations into this building on June 27, 1986 and concluded the transfer of the manufacturing operations in August 1986. Currently the active family members in the business are Greg Gundlach, his wife, Linda, Jeff Gundlach and Stephen P. "Steve" Gundlach, the youngest brother of Greg and Jeff. Steve joined the company in early March 1998.